Cascade has a built-in link checker. The Link Report dashboard widget contains a report of all broken links in a site. You can see each broken link and the assets in which the broken link is contained. Broken links can be marked as fixed and then filtered out so that only links that still need to be addressed are displayed. Only pages and files that are marked as publishable are scanned. This report runs every day at 3:30 AM. *Note: You may see some broken links in a folder called "_internal". You don't have access to this folder and it is used to store unused files. Please disregard these. 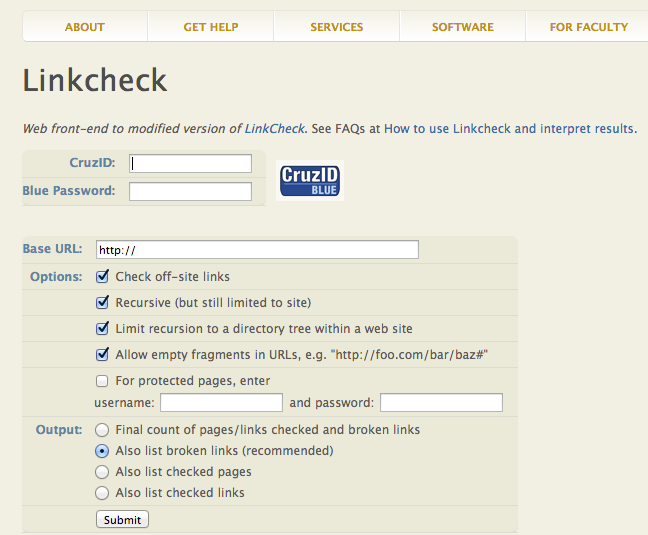 You can also run a link check report on your website using the tool provided by ITS. Log in with your CruzID Blue to use. If your website is behind password protection, e.g., your site is not yet live to the public, you will need to check the "For protected pages, enter" box, and enter the appropriate username and password. Currently, the system can run only 3 link checks at a time so you ~may~ get a message that the system is busy. If so, just try again in a few minutes. If you need help with the tool, please put in an IT Ticket. 200s - these are generally not broken links but often have a broken component such as an anchor in the URL that does not exist on the target page. 300s - these are typically links that redirect to another page and do not have to be fixed, although you may want to use the correct URL rather than rely on a redirect. 400s - these links are truly broken and should be fixed. The most common by far is 404 or "Not Found". 500s - these links may or may not be broken. They should be tested to make sure they function as expected.